Curling - It Really IS an Olympic Sport! You heard me – curling REALLY is an Olympic Sport! Four of us found that out a few weeks ago when we participated in the Howard Center’s 2018 Curling Challenge at Cairns Arena in South Burlington. We PT360ers love fundraising events, especially when it takes the form of a fun challenge, so of course we jumped on the opportunity to participate. After all, many of us were following the Winter Olympics and found ourselves talking about the curling matches again and again with our patients. Even with watching and discussing curling daily, we really had no idea what we were getting ourselves into! Push-off – The push-off is crucial for throwing a curling stone – it should provide all the momentum the 42lb stone needs to travel down to the house (the circles) at the other end. And let me tell you, it is further than you think – a curling sheet is 150ft in length, so your legs have some work to do! To get a strong push from the hacks (the blocks in the ice), you quickly extend from the hip and knee on your dominant leg, relying on both your glute max & hamstrings to extend the hip and your quads to extend your knee. Great exercises for strengthening these muscles are bridges, hamstring curls (especially on a stability ball), and single leg squats. Sliding – After you push off, you immediately go into a low lunge to slide with the stone, so you first need the hip flexibility to get there! Most people are tight through their hip flexors, so curlers work on their psoas & quads flexibility to comfortably get into a sliding position. Of course, once you’re in the sliding position, you need to have core stability to maintain it so you can control the speed & direction of the stone. Exercises to improve core stability include forward & side planks, as well as forward or walking lunges. Throwing – Next step is to throw the stone before you slide past the hog line, or the point by which you must release it. You don’t actually push the stone with your arm because all the momentum comes from the push-off, but you do need to have a strong & stable arm to curl the stone where you want it to go. Your arm must be extended straight in front of you and the turning of your wrist will introduce the clockwise or counter-clockwise rotation needed to curl the stone. Shoulder exercises, such as I/T/Ys over the stability ball, are perfect for building arm strength & stability, while wrist curls & extensions will give you the strength to control the curl. 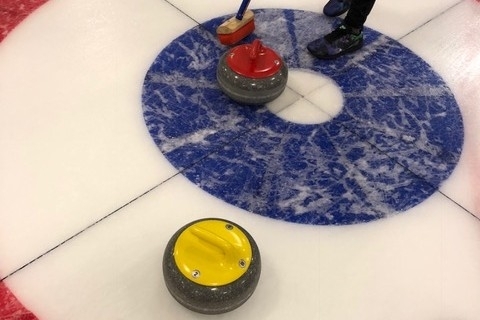 Sweeping – This is the most active part of curling because you have to sweep the ice HARD while walking alongside the stone. Curling ice is pebbled to slow the stone down as it travels, so sweeping reduces the friction between the stone & the ice by melting the ice in the stone's path. The harder you sweep (faster & with more pressure), the more ice will melt and the further the stone will slide. Sweeping requires a lot of upper body strength and conditioning – remember, a curling sheet is 150ft long! Great exercises to prepare for sweeping are bent-over dumbbell rows, mountain climbers, and interval training, as you may sweep for 25-30 seconds but only have 1 min to recover before you need to sweep again. After our practice, it became obvious to all four of us that we needed to adequately prepare our bodies for the actual event and not just our team spirit with crazy costumes and high fives. There was some stretching, some squatting, some hamstring curling (our team name, by the way) prior to taking the ice for the first time and I dare say that helped us to win 2 of our 3 matches. Well, that and my awesome job as the Skip telling everyone where to throw their stones! 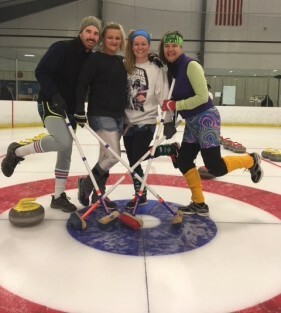 **We want to say thank you to our coach Connie from the Green Mountain Curling Club for helping us out on the ice, as well as to everyone who donated to our team – together, we raised almost $700 in 2 weeks for the Howard Center!